Formula E returned to Santiago for the second time and in the Chilean capital we saw a race of attrition and the eighth Formula E victory for Sam Bird. Bird is now only behind Sebastien Buemi, who is on 12 wins, in terms of total victories. We now take a look at the facts and figures behind the days racing in Santiago. – For the first time in Formula E we had two German drivers in the podium, with Pascal Wehrlein and Daniel Abt both finishing in the Top 3. Germany are not the first nation to have a double podium with Brazilian drivers (always di Grassi and Piquet) sharing the podium four times and French drivers sharing the podium twice. – Pascal Wehrlein was the eleventh different driver that Sebastien Buemi has shared the front row with, which is more than any other ABB Formula E driver. Nico Prost and Lucas di Grassi are next on the list having shared the front of the grid with seven other drivers each. 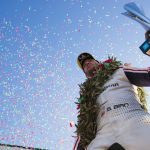 – For the last three races at least one driver has scored their first Formula E points (Oliver Rowland in Ad Diriyah, Alexander Sims in Marrakesh and Pascal Wehrlein in Santiago). This is the equal longest streak of debutant scorers in Formula E history and the longest streak since Season 1. – Both Jean-Eric Vergne and Lucas di Grassi failed to score in Santiago, and since they were the only drivers with a ten or more race point scoring streak, Buemi (9) now has the longest scoring streak, thanks to his three Pole Position points. – Eleven drivers have started exactly two E-Prixs, and all eleven drivers have scored either 18 points (Montagny, Gasly and Wehrlein) or zero points (Fontana, Garcia, Leimer, Kobayashi, Legge, Brabham, Jani and Yamamoto). 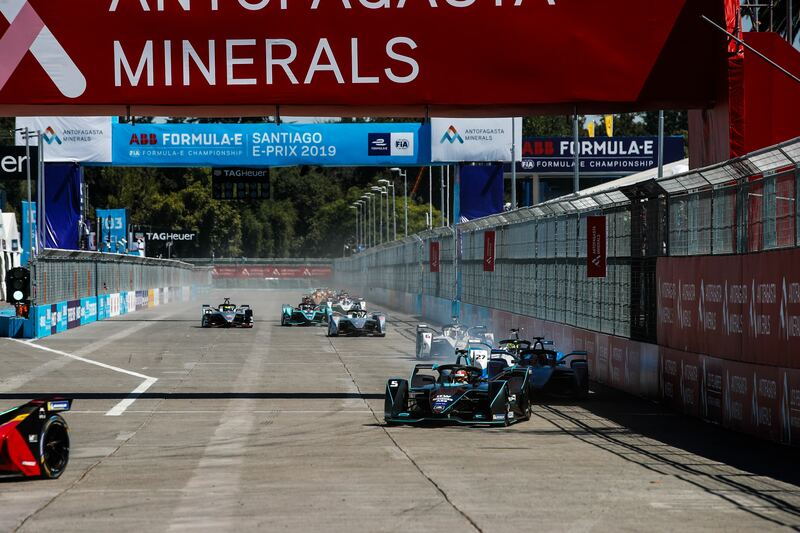 For the first time in ABB Formula E, four drivers managed to gain ten places in the same race, with Frijns, Turvey and d’Ambrosio working their way from the bottom half for the grid into the points. Nelson Piquet managed to gain eight places in the race after starting 19th, which is the Brazilian’s biggest gain in position since the Season 2 Putrajaya E-Prix. Sebastien Buemi has now retired from Pole Position three times in Formula E (after Buenos Aires Season 1 and London Race 2 Season 2), the most of any driver. As a result, Buemi lost a total of 17 places, the most Santiago and the most places the Nissan e.dams driver has ever lost in an E-Prix. Over the course of the race day, Geox Dragon’s Jose Maria Lopez set the fastest time of the day in Practice Two with a time of 1:08.194. This is the first time that a Geox Dragon driver has set the fastest time of the day. Showing how close the Formula E grid is, all eleven teams’ best lap times were only separated by 0.768 seconds. This is the closest gap between all teams since Season 4’s Mexico City E-Prix (when the grid was only split by 0.619 seconds). We can see that nine of the eleven teams set their quickest laps in Practice Two, and this is becoming an increasing trend. Since the start of Season 4, 63% of drivers have set their fastest lap of the day in a Practice session, compared to just 22% of the time in Qualifying. Since Marrakesh Season 4 (13 E-Prixs ago), Seabastien Buemi has outqualified his teammate in every race, which equals Jean-Eric Vergne’s record. We now take a look at some of the longest qualifying streaks in Formula E.
Currently, the record for outqualifying their teammates the most times in a row is held by Vergne (Berlin Season 2 to New York City Season 3) and Buemi (whose current streak is 13 races). Season 3 champion, Lucas di Grassi is next on the list having outqualified Daniel Abt for 12 races in a row from Monaco Season 1 to the Season 2 Paris E-Prix. The first driver to outqualify their teammate ten races in a row was Nelson Piquet Jr, who outqualified his four different teammates in the first ten races of Season 1. The Brazilian outqualified Ho-Ping Tung three times, Antonio Garcia twice, Charles Pic four times and Oliver Turvey one, before Turvey ended the streak at the last race of the season. Three other drivers have managed to outqualify their teammates nine or more times in a row. Oliver Turvey outqualified Luca Filippi in the first nine races of Season 4, Felix Rosenqvist beat Nick Heidfeld during nine consecutive races in Season 4 and Mitch Evans is currently on a nine race streak of outqualifying Nelson Piquet Jr.
Tom is a mathematics university student, who runs the @FormulaEStats twitter page, which gives a variety of facts and stats about the ABB Formula E Championship.